Home > Dodo Juice Supernatural Wax Machine Stick 60 ml. Dodo Juice Supernatural Wax Machine Stick 60 ml. Get a Supernatural shine with your buffer! Dodo Juice Supernatural Wax Machine Stick makes it easy to apply Dodo’s purest, most refined carnauba car wax with your buffer. Supernatural Wax is free of artificial colors or fragrances in order to achieve the purest, most effective car wax. With Supernatural, you get all the shine, depth, and protection of a premium carnauba car wax and nothing extra. This unique applicator stick allows you to apply Supernatural to your foam buffing pad without touching the wax itself. This prevents wax contamination so you get the clear, pristine shine Dodo Juice intended. 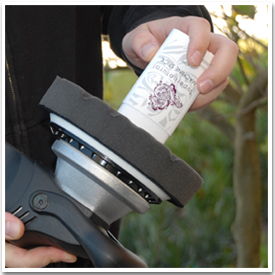 The machine stick also makes it simple to avoid over applying Supernatural Wax. Dodo Juice Supernatural Wax is made of clean, pure No. 1 grade carnauba wax imported from Brazil. This carnauba wax is cleaned and refined to create the ivory color you see in the photo. Once applied to a vehicle, the wax dries to a clear, glassy smooth shine that can only be described as supernatural. Supernatural is a super premium wax containing an enhanced amount of No. 1 grade carnauba. With all unnecessary ingredients removed, performance can be maximized in terms of gloss, protection or durability. Carnauba wax naturally offers excellent protection against rain, soil and UV rays. The natural, unrefined wax is incredibly hard and durable. Dodo Juice thoroughly cleaned and refined the natural carnauba wax and processed it to create a workable car wax that retains all carnauba’s natural characteristics. Apply Dodo Juice Supernatural Wax to any color vehicle to experience a deeper color and more intense shine. Dodo Juice Supernatural Machine Stick allows you to easily apply the wax to a buffing pad without touching or contaminating the wax. As with any car wax, we’ve found that the best results are obtained on a clean, smooth paint finish. Use a prewax cleaner, like Dodo Juice Lime Prime Pre-Wax Cleanser, to remove old layers of wax and improve the paint’s texture. Then apply a layer of Supernatural Wax using a soft foam finishing pad on your buffer. Work at a slow speed and apply a thin, even coat to one section at a time. Allow the wax to cure for 5-10 minutes. Buff off the wax with a soft Cobra Deluxe Jr. 600 Microfiber Towel, or put a microfiber bonnet onto your polisher. A lambswool pad is needed for cushioning underneath the bonnet. Apply another coat of wax after 1-24 hours if desired. Dodo Juice Supernatural Wax 200 ml. Used Dodo Juice Supernatural in the machine stick for the first time, and all I can say is Wow! Great stuff. Easy to apply and even easier to take off. I recomend the machine stick if you are going to apply by machine. It makes the application process so much easier. Use after Lime Prime for the best results!